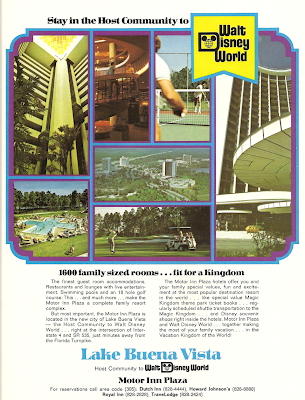 For the first few years of the existence of Walt Disney World, saying "Lake Buena Vista" would have meant very little outside of Disney's corporate offices and the hallways of Reedy Creek. This was years before the LBV Villas would become publicly available, originally leased as they were to corporate participants in Walt Disney World. This was years and years before the Treehouses, the golf course, the club house, the Village, and pretty much all the public had to go on was that there was a little squat rectangular building (the Preview Center) sitting there alongside the lake. By 1972, Disney was already in a bind. After an anticlimactic September, October and November, the droves of tourists had finally arrived to the new Florida property for Thanksgiving and the lines just to park in the Main Entrance Complex had stretched all the way down World Drive, spilling onto I-4 in both directions requiring the intervention of Florida police. Corporate bookings for such spaces as the Contemporary Resort convention space were healthy, but demand quickly exceeded supply for the resort's available 1,576 hotel rooms in the first few months. Construction to expand the Palm and Magnolia's clubhouse into a full hotel began immediately after the first Walt Disney World open, but the Golf Resort wouldn't be ready for another two years. Thankfully, by mid-1972, the first of the hotels for the Motor Inn Plaza would be ready. 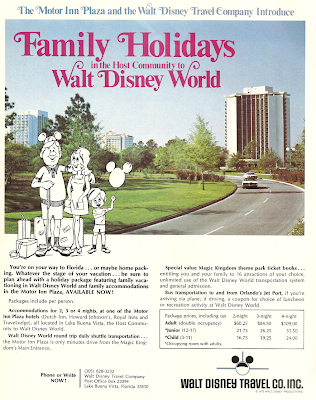 Although these non-Disney hotels along Preview Blvd today seem to strike Disney travelers as being of little consequence, they would be an absolutely essential relief valve for the first five years of the resort's existence, before the expansion of the Polynesian and Fort Wilderness in the late 70s. Let's peek into the past here, shall we? From 1973, here's some of Disney's earliest advertising for their on-site, off-brand hotels. From left to right we're looking at the Royal Plaza, Howard Johnson's with its distinctive orange roof, and the uniquely shaped TraveLodge. TraveLodge is blocking our view of the largest hotel, the Dutch Inn. Noe the Walt Disney Travel Co endorsement. In 1977, the WDTC would actually open an office in the old Preview Center, sharing space with the check-in facilities for the Lake Buena Vista Villas. 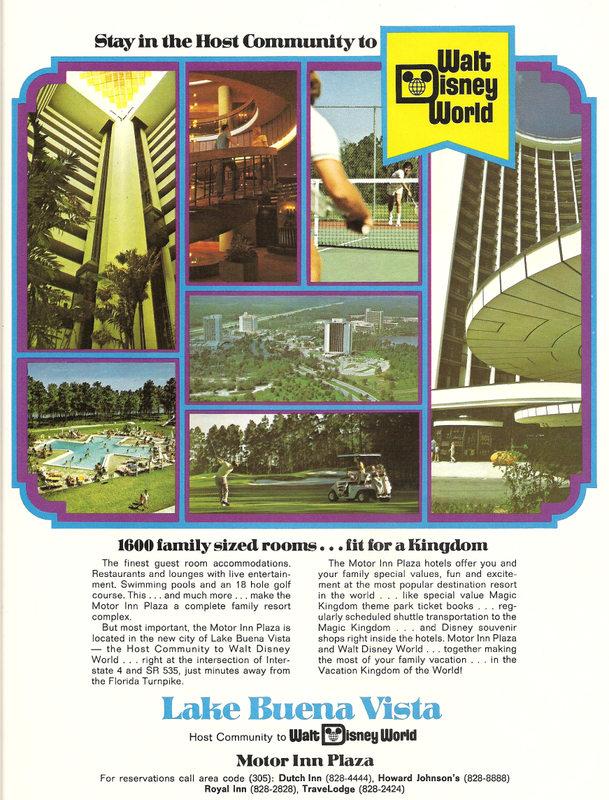 A very gorgeous 1975 advertisement, with a full color spread of images from all four hotels. The interior atrium is part of Howard Johnson's and I believe still exists in today's Holiday Inn onsite. The distinctive cross shaped pool is from TraveLodge. I wish I had more of these, but this advertisement for Earl's Seafood Grotto in the Royal Inn is evidence that the Motor Inn Plaza was indeed very popular for a time due to its distinctive restaurants and nightclubs. 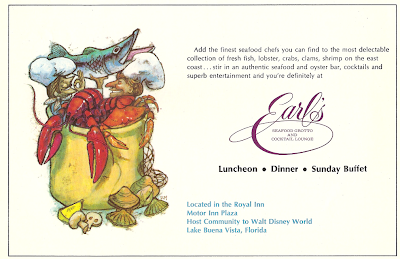 Fine Dining was a fairly scarce commodity for the first few years of Walt Disney World and guests seeking the reprieve from the Vacation Kingdom found they didn't have to drive up I-4 to Orlando or Winter Park to feel away from he Disney influence. So that's just a peek into the strange world of the Host Community to Walt Disney World's earliest years. In the late 70s and again in the 80s the Motor Inn Plaza would expand, and eventually be renamed Hotel Plaza Blvd. But the Preview Center still stands there, the absolutely earliest thing open to the public at Walt Disney World, and the observant few who stop there, park in the 150 car parking lot, and walk down to the shores of that natural body of waer known once upon a time as Black Lake, may find a little hint of bygone days.